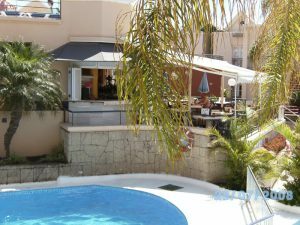 One of our Yucca Park apartment rentals in the Fanabe area of Tenerife. Available for holidays, this apartment is furnished in a modern style. We have just returned from a holiday on the Yucca Park complex in Tenerife. This is our favourite complex. We booked a one bedroom apartment this time through Karen from Holidays4u.org. It was very well furnished and had a sunny balcony. The checking in process was very efficient. We were met at the airport and taken directly to the apartment. On arrival we were shown the apartment and handed the key. At this point we paid the rest of our booking fee as well as a quite large security bond. I don’t blame the owner for charging this though. The apartment was beautifully decorated with a lot of special touches. If I was the owner I would charge a bond as well. There was a double bed in the bedroom which was very comfortable. The owner had also kitted the apartment with air conditioning, in the lounge and bedroom. The complex is in a brilliant area, just across the road from Fanabe beach and therefore very close to lots of nice restaurants and bars as well as a bowling alley, which we tried once. There was also a taxi rank nearby and a supermarket. You can also walk along the beach front promenade in either direction leading to the Del Duque beach in one direction or Torviscas Playa in the other. The beaches are well served with beach bars, water sports, as well as sun loungers and parasols. We met some lovely people around the pool. Everyone was so friendly. Will definitely return next year, or even earlier if I can persuade my husband.